The Mars Global Surveyor spacecraft is about to resume scientific observations of the surface of Mars with its first objective to attempt to photograph the Mars Pathfinder landing site, the features in the Cydonia region, and the Viking lander sites. Surveyor is coming up on a period beginning near the end of March and continuing for about a month in which orbital and lighting conditions will be suitable for these observations. The opportunities to see these targets from the Surveyor spacecraft will occur in three clusters of two and a half days each during the next month. Each target will be visible once in each cluster and the clusters will be separated by eight days. It will not be possible to predict on which orbits, and thus, on which days, the spacecraft will come closest to the targets until after aerobraking has been terminated on Friday, March 27th. Then several orbits of navigation tracking data have been obtained in order to pin point Surveyors new orbital characteristics. The exact time of the observation opportunities and the schedule and process for the release of the resulting photographs will be announced in a few days. Within a few days before the actual observations, a detailed sequence of the spacecrafts activities will be posted on this webpage, and the project staff will provide a near real time commentary on the events as they occur. Surveyors science instruments will be turned on again on Friday, March 27th, after having been off since February 20th when the orbital period became too short for both science and aerobraking operations to be conducted simultaneously. Now that aerobraking will be on hold for five months, Surveyor can return to acquiring science data. 3/23/98 23:10 UTC A194 UP ABM to 0.1 N/m2 (0.5 m/s)Took orbit up to an aerobraking altitude where the dynamic pressure is 0.1 N/m2 so that aerobraking is slowed to more easily manage the arrival at the target period of 11.6 hours. THIS EVENT HAS BEEN COMPLETED IN A SATISFACTORY MANNER! 3/27/98 08:57 UTC A201 ABX-1 (Aerobraking Termination Maneuver) (4.43 m/s) A bi-propellant main engine burn to terminate aerobraking by raising the altitude of periapsis to 170 km establishing the science phasing orbit THIS EVENT HAS BEEN COMPLETED IN A SATIFACATORY MANNER! First PERISCAN ( Periapsis Science Acquisition ) Pass This will be the first time in the science phasing orbit that science data will be acquired, and the start of the six orbit period where the navigation baseline for targeted opportunities will be established. Science acquisition will continue until early September when aerobraking will be resumed. At the launch of the Mars Global Surveyor mission, NASA announced that it would re-photograph the Cydonia region of Mars -- an area that contains a number of features including the famous "Face on Mars" -- when Surveyor was over that region during its mapping mission. In addition, NASA said it would announce to the public when these opportunities would occur and when the resulting pictures would be released. The opportunity to accelerate the schedule of photographing these areas significantly before the mapping period has been afforded by the recent modification of Surveyors mission. This modification was made to extend aerobraking for a year in order to compensate for a structural weakness discovered in one of Surveyors solar panels. Mars Pathfinder landed last July 4th, deployed the Sojourner rover and captivated world interest as it explored a small region in Aris Vallis. 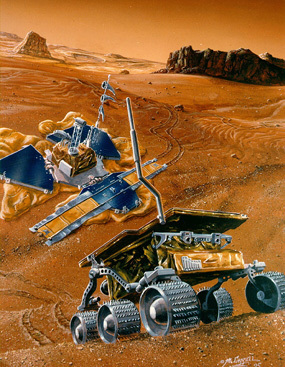 The two Viking landers that NASA placed on the surface of Mars in 1976 conducted inconclusive experiments to try to discover life in the Martian soil. The Cydonia region has become notable from the discovery of an object that looks much like a human face in several pictures taken by the Viking Orbiter spacecraft over 20 years ago. Some researchers have proposed arguments that the "Face" and other objects in its vicinity are artifacts of an extinct civilization and have pressed NASA for further investigations of the region. It is anticipated that Surveyors ground track will not pass directly over any of the targets so it will be necessary to rotate the spacecraft to sweep the field of view of its cameras across the targets as the spacecraft travels south from over the Martian north pole as the spacecraft gets closer and closer to the surface Photographs will be taken as long, narrow strips as the field of view is sweeping across the targets. The orbital conditions chosen for the next five month period when Surveyor will not be aerobraking offer a particularly advantageous pattern of near overflights of these targets. Because of the position of the targets in longitude around the planet (Viking 2 is 182 degrees to the east of Viking 1, Mars Pathfinder is 14 degrees to the east of Viking 1, and Cydonia is 24 degrees east of Viking 1) the near overflights will occur in clusters of five orbits every 17 orbits. Surveyors orbital period of 11.6 hours, which is slightly less half a Martian day, causes the spacecrafts ground track to alternate sides of the planet on consecutive revolutions. At every closest approach to the planet or periapsis, the spacecraft is about 190 degrees to the east of where is was one orbit ago and about 20 degrees to the east of where it was two orbits ago. These observations are termed "targeted" because mission controllers will take extraordinary steps to try to assure that the selected targets are within the high resolution cameras field of view. This is a difference process than has been used in the past or will be used in the future to collect images of Mars from Global Surveyor. The normal manner of acquiring images and other science data is to point the instruments straight down at the surface or to take science data as the instrument fields of view sweep across the planet as the spacecraft performs maneuvers to accomplish aerobraking. During the aerobraking hiatus last Fall, the instruments were pointed straight down at the surface during the few minutes that the spacecraft was closest to the planet. During the two years of mapping that will start in March 1999, the instruments will always point straight down at the planets surface. The photographs that have been acquired during the just concluding aerobraking phase were acquired on each orbit, a few minutes after the closet approach to the planets surface and after aerobraking had completed, as the spacecraft was being rotated from the aerobraking attitude to the array normal spin attitude used during the rest of each orbit. WHY ARE THESE OBSERVATIONS BEING MADE NOW? Surveyor is just completing its first period of aerobraking -- a portion of the mission in which the spacecraft skims through the top of the Martian atmosphere at each closest approach to the planet in order to circularize its orbit. Currently, Surveyors orbital period has been reduced from its initial 45 hour duration to under 12 hours. The orbital period will stay at 11.6 hours until early September when aerobraking will resume again for the final five months of aerobraking to reach the exact orbital conditions necessary to begin Surveyors two year long mapping mission. During the period without aerobraking, Mars will move around the Sun to a position where the lighting of the Martian surface under Surveyors flight path will be optimum for the mapping observations. The upcoming opportunities appear to be the best of the period because the periapsis location will be migrating to higher latitudes and going over the north pole later in the period, and thus, the distance to the targets will be increasing. In the next few weeks the elevation of the sun will be between 15 and 20 degrees at the high latitude targets (Cydonia and Viking 2) which will make for good imaging. The sun elevation will be between 40 and 45 degrees for the low latitude sites (Viking 1 and Mars Pathfinder) which will make for acceptable imaging. HOW WELL WILL WE BE ABLE TO SEE THE TARGET IN THE IMAGES? For Example, the field of view of high resolution camera covers a width of 3 km (1.9 miles) when the camera is 400 km (249 miles) from its target. The length of the image will be several kilometers (several miles). The resolution, or smallest feature discernible in the image varies with the distance to the target, but at this distance will be approximately 1.4 meters (4.6 feet). The Mars Pathfinder and Viking landers are about 2 meters (6.6 feet) in diameter, or very close to the minimum resolution obtainable. The features in the Cydonia region are on the scale of 1 to 2 km (0.6 to1.2 miles) and should be readily visible and may nearly fill the width of field of view of the images. Until the exact orbit characteristics are known, we will not know the exact distance to the targets. It could be further than the 400 km quoted in the example above and the resolution would be poorer, or it could be closer. The Mars Pathfinder and Viking landers are very small targets, at the limit of resolution of the camera, even at the closest distance. It will be an extraordinary event if they are recognized in the images. Features in the Cydonia region, however, being hundreds to thousands of times larger, will be very easily seen, even at the more distant ranges, and while all features in this area may not be within the field of view due the expected targeting errors, there is a high probability that many will be seen with good resolution. The best known location of the "Face" will be the target point in Cydonia. WHAT IS THE PROBABILITY THAT THIS IMAGING WILL BE SUCCESSFUL? OR ARE WE SURE WELL GET THE PICTURES? The probability that the targets of interest will be within the cameras field of view varies between 30 and 50 percent. This is because there are a number of sources of error or uncertainties associated with the targeting process. One such error source relates to how good the current maps of Mars are. As all early explorers on Earth found, early maps contain many inaccuracies. The data obtained by Surveyors laser altimeter and cameras in the last few months have indicated that locations of observed objects on the surface are displaced 1 to 2 km (0.6 to 1.2 miles) from where the Viking era maps locate them. Another source of error is the accuracy with which the spacecrafts trajectory is predictable. This involves where the ground track of the flight path lies or will lie on the surface, and the time the spacecraft will fly over or near the desired targets. The accurate prediction of the ground track allows the mission controllers to decide how much to rotate the spacecraft to point the camera, and the timing prediction will be used by the camera operators to control when to record the image. In preparing the Surveyors sequences for these observations, mission controllers will use the results of orbit computations made as near to the planned observation time as possible in order to minimize this uncertainty. In addition, some error is introduced by the planets rotation translating downtrack error into crosstrack error. The last source of error is how accurately the spacecraft can be rotated and pointed. The design specifications for Global Surveyor call for it to be pointable with an accuracy of 10 milliradians ( 0.057 degrees), that is, mission controllers should be able to point the instruments to within 10 milliradians (0.057 degrees) of a target. Experience with the spacecraft indicates that it actually performs much better, and that a pointing accuracy of 3 milliradians (0.017 degrees) is possible. Combining these error sources together in the proper statistical manner with the distance from the spacecraft to the targets tells us the probability that the targets will be within the cameras field of view. This probability varies from about 70% when the targets are 1000 km (621 miles) from the spacecraft, to about 25% when the targets are 400 km (249 miles) from the spacecraft. WHY ARE THESE IMAGES IMPORTANT? A great deal of controversy rages over the interpretation of the features seen in the Viking images of the Cydonia Plain. Additional photographs with the much better resolution that Surveyors camera will provide and perhaps different lighting conditions can provide new information to aid in the understanding of what is seen there. In addition, the observations of the previous landing sites provide scientists with important knowledge to tie together the observations made on the surface from the landers with those made from orbit above the planet. The Viking 1 Lander site is the first location on Mars where humans were able to see and touch the Martian surface at a familiar scale. This site, the following higher latitude Viking 2 Lander site and the Pathfinder site play a large role in understanding the processes which have operated on the Martian surface over time and the state of the surface and atmosphere at present. These sites serve as "ground truth" locations where ideas developed from orbital observations can be tested, verified and then extended to other regions of Mars such as those we may wish to visit in the future. Several examples of this use of the sites for ground truth illustrates their significance. One of the results of the Viking Orbiter Infrared Thermal Mapper experiment was a rock abundance map based on the observed change in surface temperature over time (large rocks cool more slowly than sand or dust). The only way to verify the results of this rock abundance map was with the two Viking landing sites where, fortunately, numerous rocks were present. Rock abundance knowledge helps in understanding the depositional history of the surface and large rocks represent a landing hazard. Mars Global Surveyor carries an advanced version of the Viking instrument called the Thermal Emission Spectrometer (TES) which will be able to map rock abundance at more than one hundred times higher spatial resolution than Viking and the TES experimenters will have another site (Pathfinder) to use to verify their deductions. The high resolution mode of the Mars Orbiter Camera (MOC) carried by the Mars Global Surveyor spacecraft is capable of returning images of objects as small as 1.4 meters across. Some of the largest rocks in the area of the landing sites may be visible and such rock or boulder fields have been seen in MOC images at other locations on Mars. The careful surveys which have been done of the distribution of rocks as a functions of rock size can now be used with MOC images to estimate rock populations at other locations on Mars. The Global Surveyor spacecraft is in excellent health. For the next five months, Surveyor will be maintained in an 11.6 hour period elliptical orbit around Mars. Its closest point to the planets surface will be 170 km (106 miles) and its furthest distance will be 17,864 km (11,100 miles). WHATS NEXT AFTER THESE SPECIAL OBSERVATONS? The observations described above will occur three times during the month of April. Surveyor will continue to acquire science data from its other instruments during the month. Then, during May, Mars, and hence Global Surveyor will move behind the Sun as seen from Earth. During this period of solar conjunction, communications with Surveyor will be greatly degraded. Surveyor will cease science observations and will be put into a special attitude to assure proper temperatures of the science instruments. For two out of every eight hours it will point its high gain antenna to Earth to conduct radio communications propagation experiments, and, for part of the time, to allow mission controllers to monitor the spacecrafts health. At the end of May, Surveyor will return to acquiring science data from all its instruments.